Fortunately there are some really easy ways of making sure you’re looking at a brand new pair of the 500 Pro series and not an older model. These just so happen to be the main talking points as to why they’re worth investigating in the first place. Synergy. Ain’t it grand. For a start they look ever so slightly different. I realise that’s not exactly the world’s biggest point of difference to kick things off but it’s an important one none the less. This is mainly because up until now I’ve personally found RIG headsets to be more ghastly than anything else and this new lineup goes a long way to changing my opinion. They’re still made up of the same components synonymous with the RIG brand: a robust, low weight arching band that’s borderline indestructible connecting each ear-cup, the comfortable sling beneath it that moulds and cups your head like a warm hug and adjustable open backed cups that have seen the largest change in the new models incorporating a new design and the home for larger, better performing and great sounding 50mm drivers. The move from the prior generations 40mm drivers is a significant one. The sound has a sharpness to it that when directly comparing the two is like night and day. Bass is rich and punchy whilst the virtualised directional sounds of bullets zipping past your head retain clarity, not drowned out by the game’s environmental noises. Back in the real world, environmental noise is unfortunately all too much of a factor for my liking. The one downside in keeping the RIG series so light and comfortable for longer periods of wear is the non-sealed backing of its ear cups meaning that whilst your ears can breathe it’s quite prone to letting external noises in. They do include two versions of the cups you can clip on, one a material covered memory foam, the other a leather-like version, which, if you’re using those do battle external noise slightly but will never stop it entirely. Connecting your 500 Pros to your platform of choice is done via a cable, even on the top of the line Esport edition, which makes sense as most of the pros prefer it eliminating any reason for lag in all aspects of their game. The model you purchase will dictate exactly how you connect and whats in your box but it boils down to two cables, one for console and one for PCs with both included on the multi-platform and Esports editions. For PCs the cable is your relatively standard 3.5mm connecting headset jack, it runs a little shorter than I’d like but then when you’re on your PC the likelihood is that you’re sitting directly in front of it and not metres away on a couch. The cable is flat, which I actually prefer, and inline is a volume control slider that sounds like nothing new but as it physically slides in correlation to what you hear it has a definitive min and max setting that +/- buttons often lament. On the console front the new series ushers in what I think is one of the greatest implementations of headset/console connectivity yet with Plantronics’ new Game Audio Dial. Just like the PC version it’s essentially a short-ish 3.5mm cable you plug into the headset, but on the end that connects to your console’s controller is a new dial that moulds to the controllers shape and plays home to its 3.5mm connector. The dial then neatly sits just centimetres from your thumbs as you game and serves as a volume control allowing you to roll your thumb over it to go from a physical minimum to maximum. It’s so simple it’s genius and while I’m sure you think I’m mad for going on about it with such vigour I promise you you’ll be thanking me (and Plantronics) for talking about it so much when you start using it everyday. 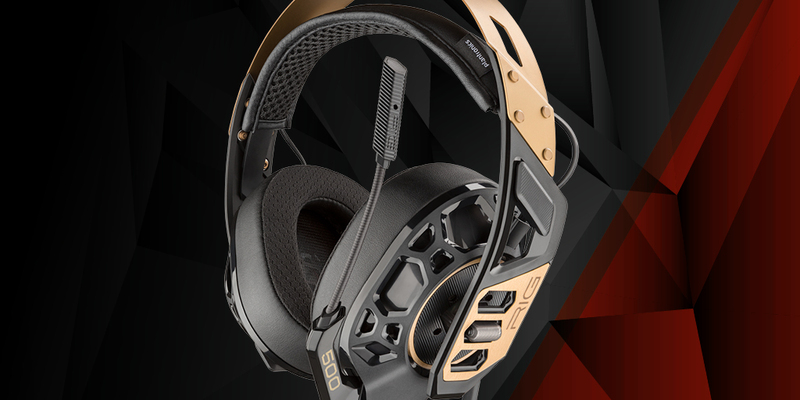 There’s a reason Plantronics’ headsets are so popular. They’re well priced, durable and they sound great. The new RIG 500 Series doesn’t disappoint, in fact, with its new accessories and bigger drivers I’d say it goes well beyond that and delivers!